Preheat your oven to 350°C. Prepare a cookie sheet to hold about 20 small cookies. Mix all the ingredients except the sesame together to make a soft dough. Make small balls of the dough and dip one half in the sesame. Flatten the balls slightly as you place them on the cookie sheet. Bake for 15 minutes and remove to a wire rack. Bite into one while it’s still warm and let that thambuttu deliciousness waft over you. Even better, pair this with a hot cup of coffee, sweetened with palm jaggery. These cookies will soften over a couple of days. They’re still good – they then taste like kajjaya! 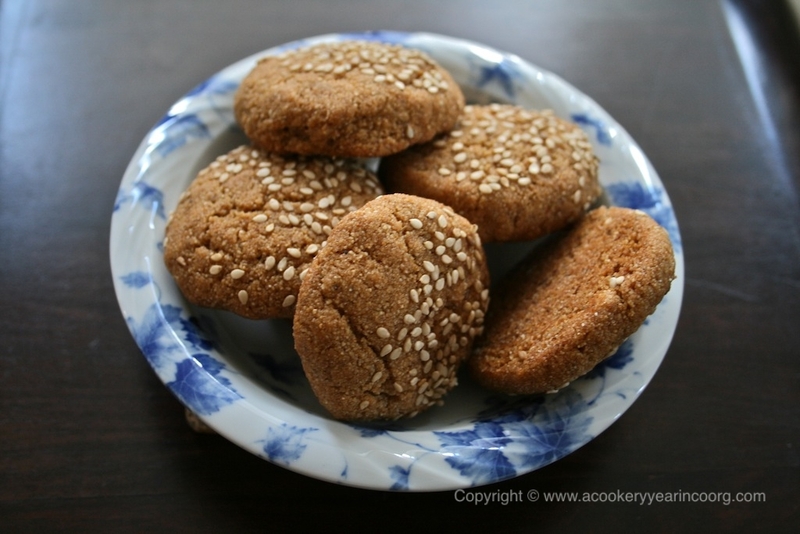 *If you’re unfamiliar with the texture of cookies made with rice flour, these may seem a little crumbly and grainy compared to those made with wheat flour.I wouldn’t change this here, because that slight graininess is something that I enjoy in the original thambuttu. I’m still working on refining this recipe and I’d appreciate any feedback from readers who try this recipe out. Thambuttu Cookies! Brilliant…will surely try this one.Shakthi, thank you for the recipe.